Enter the AEM Fuel/Ignition Controller (F/IC), a new generation of advanced piggyback controller which has a unique feature of O2 sensor remapping allowing OBD2 vehicles like the Toyota Vios to be mapped without issues of the stock ECU relearning over the piggyback tune. If you recap one of my posts on the Innovate Motorsports Wideband, I mentioned about the issue of OBD2 compliant vehicles' ECU relearning over the piggyback tune during closed loop operation. 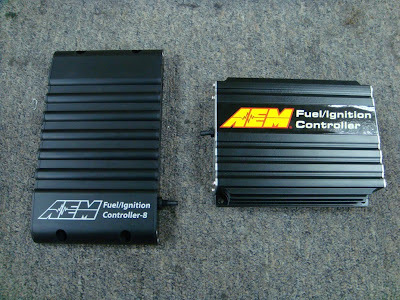 Besides the HKS F-CON iS and the Greddy F-Manage, the AEM F/IC is another piggyback which allows you to perform closed loop mapping by altering the O2 signals to the ECU. Now your tuner is able to fully map the car from 0 RPM all the way to the redline irregardless whether your car is in open loop or closed loop, something which the E-Manage is not able to do at the moment. This is a much more advanced piggyback compared to the old school E-Manage that you're probably familiar with. The F/IC comes with an onboard 25 psi MAP sensor and with the F/IC-8 it not only can recalibrate your speedometer, it even has the ability to drive up to 8 additional injectors while allowing your MAF sensor to be removed altogether without tripping the check engine light. You may read up more on the AEM F/IC directly at AEM's website here. Paul Oleandi of Dezod Motorsports, coined the 'Sciontologist' by Modified Magazine who made fame by tuning out heavily modded Scion TCs, gave the AEM F/IC a thumbs up via his review here. There are only 2 units available from GT Auto at a very special price as they are looking for OBD2 cars like our Toyota Vios to install and test it out. If you are interested, please feel free to contact Thomas Ho from GT Auto directly through his mobile at +60196625384 or just drop by their shop in Bandar Sunway to find out more. Don't miss out the opportunity folks! bro, not like you don't know thomas! go talk to him directly la! the FIC will be a better choice for your turbo kit than the e-manage blue, trust me! hi bro, yes you should absolutely consider getting one. as for the pricing, why not you contact GT Auto directly as i listed out their contacts in the post.